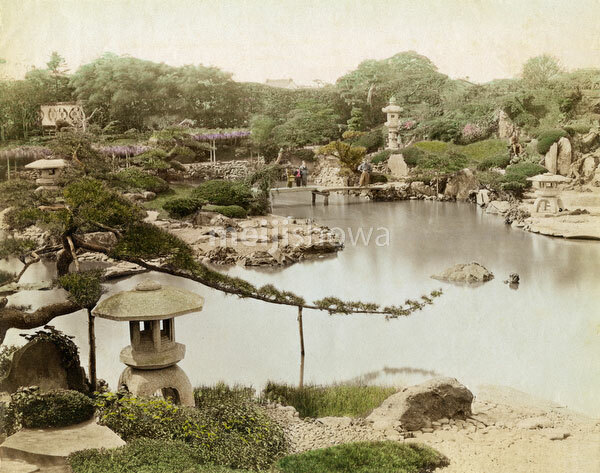 The Teien (Japanese garden) at the detached villa of the Hotta Family of the Sakura Han domain (佐倉藩) in Tokyo (堀田庭園). The plot was bought by Sapporo Brewery in 1900. The Asahi Beer Building and Sumida Ward Office are now located here. Listed in Kimbei Kusakabe’s catalogue, but have also seen this image attributed to Kozaburo Tamamura.